Annals of the Evergreens with "What offering have I, dear Lord"
Review of "Autumn's Divine Beauty Begins"
This section of the Dickinson Electronic Archives features writings by Susan Dickinson, most of which have been lost to literary study for the past century. These writings are complemented by the 1998 publication Open Me Carefully: Emily Dickinson's Intimate Letters to Susan Huntington Dickinson. With both of these publications, we join the mission of the Martha Dickinson Bianchi Trust, which "entails a strong commitment to new research and greater access to Dickinson materials" (see Martha Dickinson Bianchi Papers). By making these documents from a relationship central to Emily Dickinson herself (but relatively marginalized in Dickinson studies) readily available to anyone interested in them, we hope to encourage further scholarly debate that will in turn generate new insights, understandings, plans for critical and theoretical inquiry. 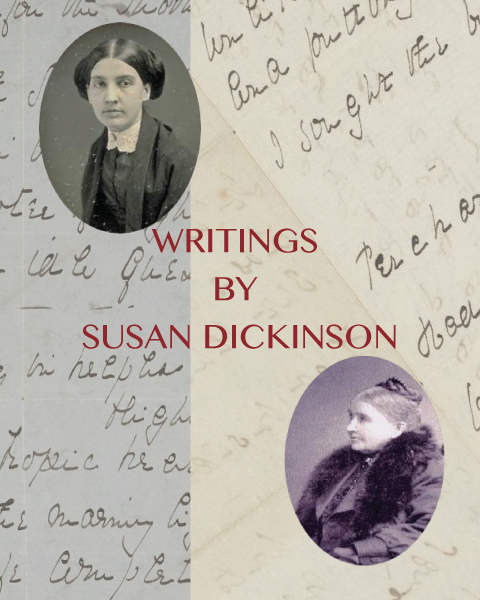 Reflecting a profound mutual influence between these two women writers, Susan Dickinson's poems, reviews, essays, letters and notes, which have rarely been read and have not been studied in any sustained way, cast new light on Emily Dickinson's poetic project, her artistic goals, ambitions, beliefs, and commitments. These new materials also render new information about nineteenth-century life among the genteel and literary.